← It’s a laptop case, not a Tri-corder Jim! So lately i’ve not been working on a knitting project… I’ve started my first quilt. 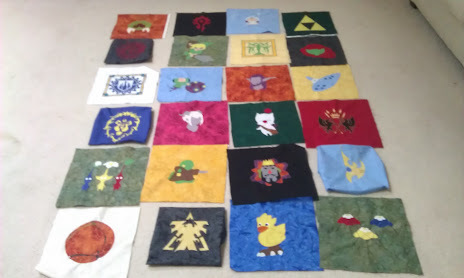 Which after reading a few How To’s about the internet I decided to try my hand at machine appliquéing some fun video game related images onto my squares. It didn’t look like the applique would be terribly hard in concept so I figure I’d give it a go. My theme would be games that Ben and I enjoy playing together. I picked out Final Fantasy, Zelda, Metroid, Pikmin, Katamari from the consoles… and then Starcraft 2, World of Warcraft and Final Fantasy XI from our online gaming collection. Well I’ve managed to get all 24 of my quilt squares (going for a twin/family room size) mostly done. I still have some finer detail to work out on the last 4… three of which are Kingdom Flags from FFXI, and one which is based on original art. I’m close to being able to start putting this together! 24 squares at least all mostly finished and laid out. The middle two face squares are actually based on art that my good friend Allison drew of Ben and mine’s main characters from WoW. You can find her original images on her tumblr page HERE! So that’s what I’ve been up to that isn’t knitting! Though I do have an idea (or six) running around my head….